The Weinstein Company has decided to push up the release date for Carol, the latest film from director Todd Haynes (Far From Heaven) starring Oscar winner Cate Blanchett (Blue Jasmine) and Oscar nominee Rooney Mara (The Girl With the Dragon Tattoo). Previously slotted to open on December 18th, the film is now scheduled to open (likely in limited release) on November 20th. The move should give the romantic period film- an adaption of the groundbreaking 1952 novel by Patricia Highsmith (The Talented Mr. Ripley)- some more room to breathe as it prepares an awards friendly run. Part of the move may have to do with the fact that Carol was originally slotted to open against behemoth Star Wars: Episode VII – The Force Awakens, which will surely dominate the movie-going conversation this December no matter what. Instead, Carol is now slated to open the same weekend as The Hunger Games: Mockingjay – Part 2 and The Secret in Their Eyes, another potential awards contender starring Oscar nominee Chiwetel Ejiofor (12 Years a Slave) and Oscar winners Julia Roberts and Nicole Kidman. It is, however, a release strategy that The Weinstein Company has used successfully with past releases including The Imitation Game (November 28, 2014), Philomena (November 22, 2013), Silver Linings Playbook (November 16, 2012) , The Artist (November 25, 2011) and The King’s Speech (November 26, 2010). All of those films were nominated for Best Picture and the latter two won the big prize. 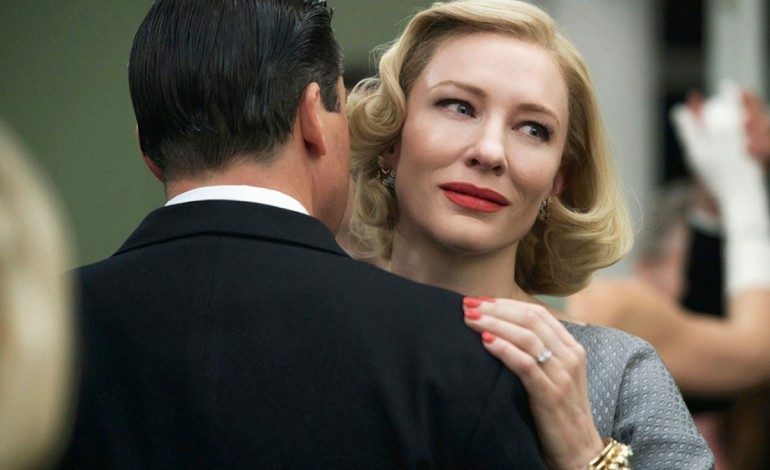 Carol tells the story of a department store clerk (Mara) who unexpectedly falls for an older, unhappily married woman (Blanchett) in 1950s New York. Kyle Chandler (The Wolf of Wall Street), Sarah Paulson (12 Years a Slave), Carrie Brownstein (Portlandia), Jake Lacey (Obvious Child) and John Magaro (Unbroken) co-star. Carol marks Haynes’ seventh feature film- he earned an Oscar nomination for scripting the Julianne Moore-headlined 2002 Douglas Sirk homage Far From Heaven; previous credits include Velvet Goldmine, Safe and the Bob Dylan bio I’m Not There (which also featured Blanchett, in an Oscar nominated performance). Phyllis Nagy, Emmy nominated writer/director of the HBO movie Mrs. Harris, wrote the screenplay. Carol made its world premiere at the 2015 Cannes Film Festival where in played in competition and earned some of the strongest reviews of the festival. Mara earned the Best Actress prize (sharing the prize with French actress Emmanuelle Bercot). The film will hit theaters on November 20, 2015.